There is much to say about St. Benedict, whose feast is today, known the world over as the man who brought monasticism to the western world. 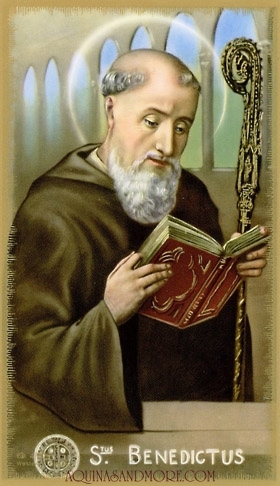 Although Benedict lived 1,500 years ago his influence is still felt and one might say is being proliferated more broadly than ever before because of a movement called “monasteries without walls.” Lay people who are interested in deepening their spiritual life often turn to The Rule of St. Benedict for guidance and a way to live his principles in secular society. Most prominent in “the Benedictine Way” is ora et labora. That phrase, meaning “prayer and work” speaks of the balanced way in which the day is designed in his Rule. It includes work alone and work with others as well as prayer alone and prayer with others, experienced in a rhythm that gives not only form but meaning to each day and thus to all of life. (See Joan Chittister, OSB: Wisdom Distilled From the Daily, chapter 6 for a brilliant explanation of this concept.) In this world of excess for some and lack for others as well as in the use of time, we could do well to reflect on how we spend our days. In tandem with this concept of balance is the call to hospitality. Based on Hebrews 13:2 that says “Do not neglect to show hospitality to strangers, for thereby some have entertained angels unawares,” St. Benedict preached the necessity of welcoming everyone that we meet. How our world would change today if we took that advice to heart! As we think of the influence of well-known people in our own day like Joan Chittister, Thomas Merton and Thomas Keating who have followed the rule of Benedict and shared it with the world, let us pray in thanksgiving also for the countless Benedictine monks and nuns through the centuries who have lived the life and carried the legacy of Benedict faithfully into the future.